Fawcett’s Gold Medal paperback original imprint published some of the toughest, leanest, brilliantly plotted, noir and hardboiled novels to ever grace the drugstore spinner racks from the ’50 to the ‘70s. Ornamented with fantastic cover art, Gold Medal paperbacks stand as a legacy from the top authors of a generation. Unfortunately, too many of these novels have been forgotten or lost to time, banished to the tables at paperback collector shows. While they are scarce, a few can still be found in the wild. They haunt the shelves of Goodwill, Salvation Army, and other thrift stores, waiting desperately for somebody who will recognize the power and value of the stories still within their covers. Stark House Press is to be commended for their current Black Gat Books imprint dedicated to bringing back into print some of the best authors from the Gold Medal heydays. Authors such as Harry Whittington, Orrie Hitt, Leigh Bracket, and Vin Packer are names from the past brought back into the public conscious by Black Gat to get their well-deserved due. 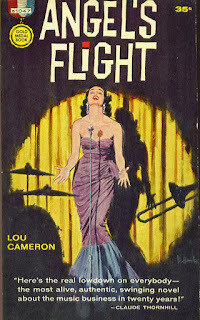 The latest title from Black Gat is Lou Cameron’s Angel’s Flight. Cameron wrote more than 100 books in his career. Angle’s Flight was his first and it remains a killer of a tale. 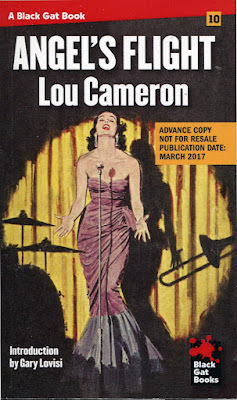 It’s a crazy ruthless story of the music business told from the inside, from swing jazz to bebop to rock & roll. Angel’s flight is noir at its darkest—desperation on steroids—and a stunning read for anyone who has ever experienced a fascination with the dark side of life.